Jacob is now nearly three months old and I have been seriously neglecting this blog. There are two times I often write, either in the evening or on the bus on the way to or from work, but I’m not back to work yet and I go to bed pretty much as soon as both kiddos are asleep (to catch every possible minute of sleep I can). And writing during the day…..ha ha, you must be joking….in between feeding, changing, washing, feeding, changing, spending a few precious moments with Elisabeth whilst Jacob sleeps, feeding, changing, cooking, feeding, changing, eating, bathing etc there is not much time left. So, unfortunately, blogging will have to wait until I have a few minutes in the morning, like today. Things are going well though. Jacob is sleeping really well, I feed him during the day and we give him a bottle of formula before he goes to bed. I struggled with the endless feeding in the evening and we quickly decided that it was better to give him one bottle a day so I’d have the energy to feed him during the day than giving up altogether. I would like to continue breastfeeding until he is 6 months old, but I am finding it quite hard. 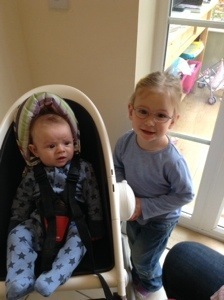 Elisabeth is doing great, she has only told me once that she wanted Jacob to go and that was when she was really poorly. The poor little lamb had a couple of weeks of temperatures, being sick and a really nasty cough. But most of the time she loves having her little brother around. The other morning I was downstairs making a cup of tea and I heard Jacob cry. I was about to go upstairs and see what was wrong when the crying stopped. When I got back upstairs, Elisabeth was sitting next to Jacob and was gently rocking him in his bouncy chair to stop him crying. Very cute. I find it really hard not having enough time to play with Elisabeth, I try to give her one on one attention whenever Jacob sleeps, but it is hard. She still goes to her lovely childminder on Tuesday which she really enjoys and it gives me some time to spend with Jacob and catch up on some chores. We were hoping that she would get a pre-school place at the local school this month, but unfortunately she will have to wait until September. Anyway, I think Elisabeth has just woken up and Jacob is starting to get hungry, so must go. Thanks Diane. I am trying to go to bed as soon as I can, the extra sleep is nice but it would also be nice to spend a bit more time with my husband, but sleep is more important at the moment. Glad you are doing okay and the kids are well. I hope Jacob continues to sleep well. I remember what a challenge Elisabeth. Enjoy the new cast member. It sounds like you and the crew are in a good place. Yes, Elisabeth was a challenge indeed. Hopefully I won’t have to bore everyone with my no-sleep stories this time around. Just remember something that my wise old grandmother told me when I was 11 years old and didn’t have time to do things: “You always have time for those things you do first.” That has served me well for 48 years! That is very wise indeed, thanks!